Dogs are by nature a sociable, pack animal and should never be left alone for lengthy periods when they can become noisy and even destructive. This can in turn lead to tension with neighbours and costly damage to your home. It is our opinion that such behaviours are understandable and can be avoided. Responsible parents would never contemplate leaving young children at home so why take chances with your dog? The reality of modern living invariably means that we have to go out to work and this can limit options where responsible pet ownership is concerned. 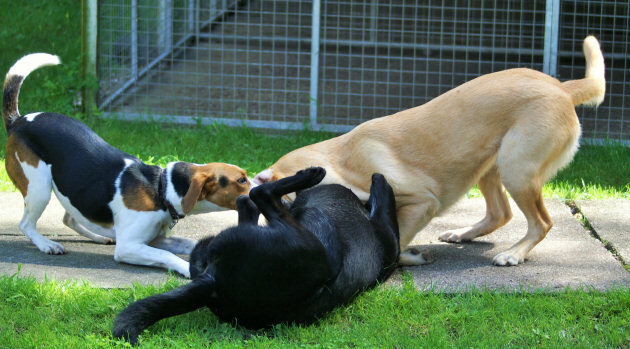 Day boarding at our day crèche can offer a solution and means your dog will be cared for all day, and able to play with other dogs. You also have peace of mind knowing they are happy and safe, not home alone. Day boarding at our day crèche can also work out a lot more economical than you think. (See Useful Information for our charges). We do not charge by the hour but a full day at our day crèche can cost much less than a dog walker or home visit and you do not need to consider home key security and the effect it can have on your insurance. The day crèche is already popular and places are therefore limited. Some of our customers bring their dogs every day while others may use this facility just one or two times per week. Day boarding is also used as a means of familiarising your dog with the kennel environment or quite simply there are times when you need to do human stuff and your dog would be better doing dog stuff with us. Without doubt the best advert for our day care services are the dogs themselves it is a delight to see them each morning, excited and pulling on their leads to get in. If you think our doggy day creche may be good for you and your dog(s) please telephone us for a no obligation chat and we can arrange for you to come and look around. We know that it is impossible to suit every one with our opening times but we have tried to cover the average working day and our day crèche is open every day (Monday to Friday) with quick and easy drop off from 7.30am with the last pick up by 6.15pm.